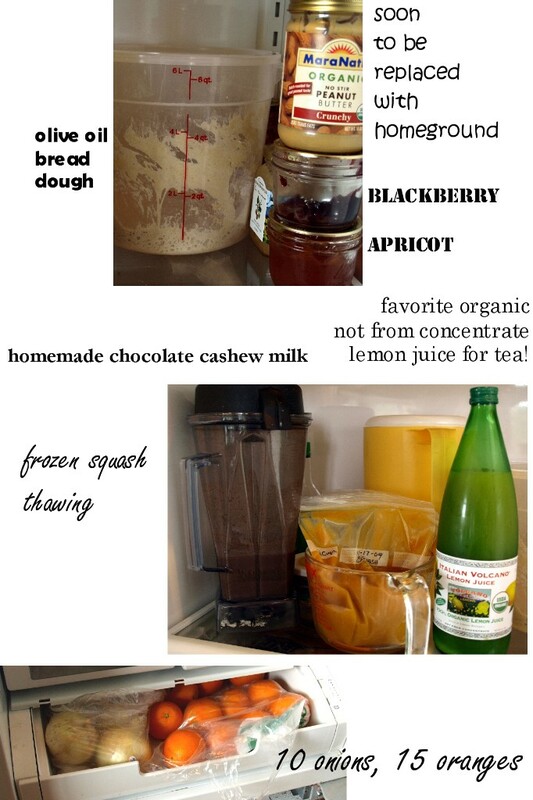 Today we thought we’d kick-off the Real Food Challenge by sharing some photos of our refrigerators. A bit scary – YES! 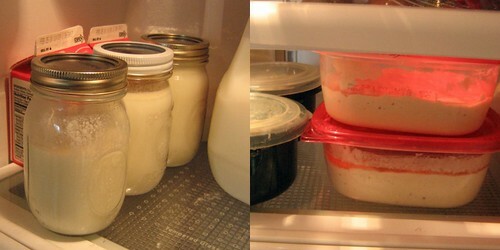 Here at Chiot’s Run my fridge is full of raw milk, homemade canned items and made-from scratch items. You’ll rarely find something with any printing on it, unless it’s a bottle I’ve saved and am reusing. As I start the Real Food Challenge I’ll be trying to eat more seasonal items, so I think during the month of March it will be full of butternut squash ravioli, pumpkin soup, fresh local mushrooms and winter greens, eggs from the farm and hopefully some other interesting things I can find at the market. If you click on the photo above it will take you to my Flickr page, I have notes on the photo so when you mouse over it you can see what all the items are. I thought about the quote above when I was cleaning out my fridge a while ago. I noticed that just about everything inside was sourced locally. Even my milk comes from only a few miles away, fresh from the cow the day after it’s milked. The last couple years our diets have gone from: a healthy diet, full of lots of supermarket veggies and fruits to a diet full of organic veggies and fruits mostly local sources. We’ve learning to love seasonal eating, not relying on broccoli for our vegetable of the week. It’s been a wonderful adventure and I can’t imagine not eating this way. It is a bit of challenge in the beginning and can seem a bit overwhelming, but it gets easier as you find local sources for more things. I actually feel like I spend less time shopping and acquiring my food now that I do it locally and grow some of of my own. Susy’s refrigerator amazes me. Down here at Unearthing This Life I was petrified at the aspect of showing off my cold storage. After a good cleaning and a lot of expiration dates I decided that I had things in shape for a few photos. While my view isn’t as impressive, I’m still proud to show off the steps we’re taking toward Real Foods. Anyone can do it by taking little steps. Right now the box is a little more empty than usual. I’ll be doing some shopping on Monday to stock up on local milks and cream for cheeses and butter as well as some fresh local foods if I can locate some. That top right shelf will be off limits during this upcoming month. If worse comes to worst I know I can rely on my sourdough starter, homemade jams, some local milk and eggs. The freezers chock full of last year’s bounty and I’m a leisurely drive away from my favorite butcher and processor. 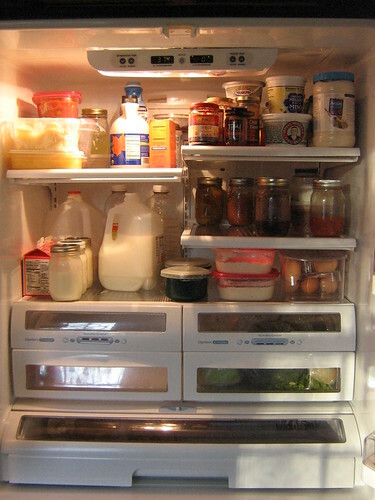 Kim here and frankly after seeing the two frigs above I almost turned and ran…you see I didn’t clean my frig for this. I also have 5 kids so my frig is ALWAYS a wreck. So I made a little collage to give you a small sampling of what is in there…I left the messy parts off! Things that we won’t be giving up. Oranges…my husband has 4+ a day. My organic not from concentrate lemon juice that I use in my 5+ daily cups of tea…sorry can’t do it! 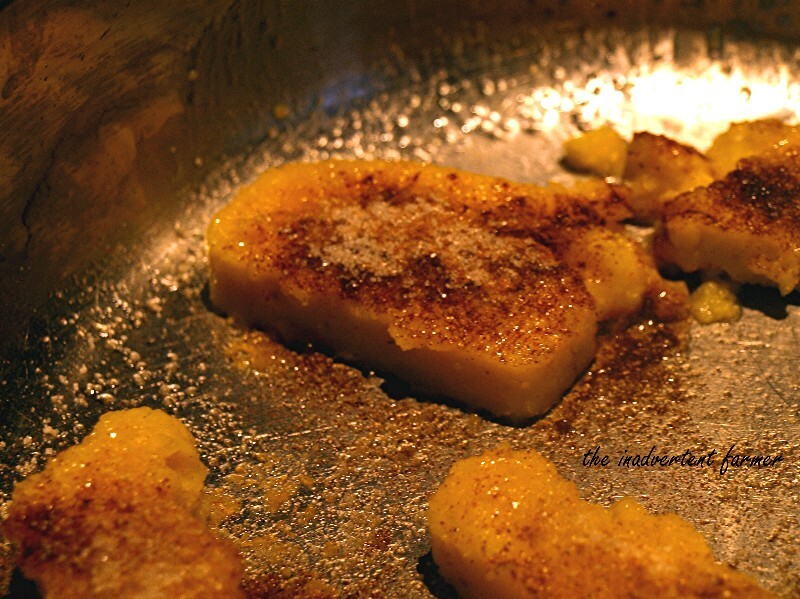 Cornmeal Mush, Hasty Pudding, Polenta…Whatever! Here is a modification of the recipe I found in the Little House cookbook and ones I found on the internet…the cooking time has been cut way back from the hour it took Laura’s grandma! 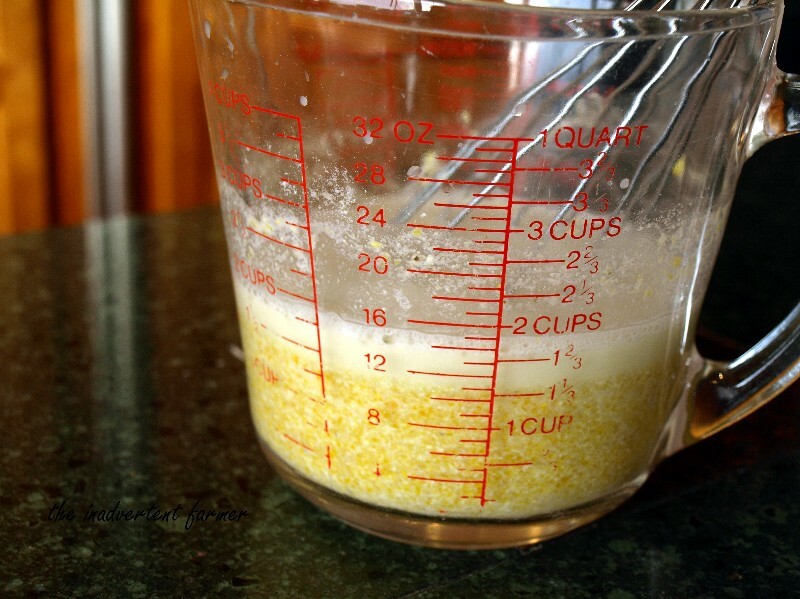 Basically all you need is cornmeal, liquid (water and/or milk) and a little salt. 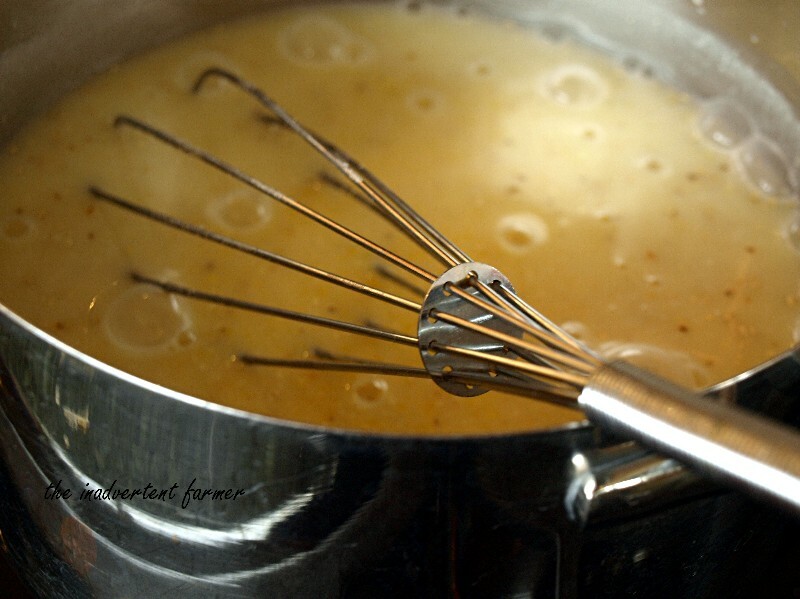 Just before it boils whisk 1 cup cold milk into 1 cup of rough ground cornmeal. We eat ours with maple syrup and berries…or molasses and milk. You can also serve it savory with something like cheese and green onions. 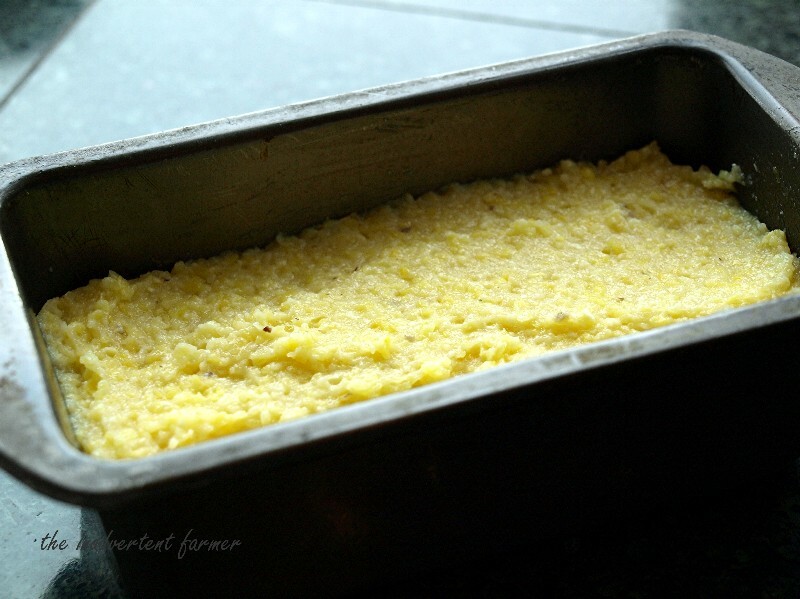 With any leftover you can put it into a small loaf pan to mold it, refrigerate and then later slice and fry the polenta. 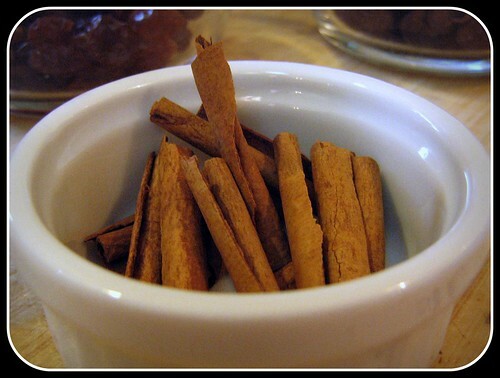 Try it with a little cinnamon and sugar…oh my! This is a super easy and very inexpensive breakfast idea…or any time you want something filling, warm, and simple! So do you do mush? Kim can also be found at the inadvertent farmer where she raises organic fruits, veggies, critters, kids and…a camel. Yes when I have pondered the last few weeks about the challenge I have been caught up in the nitty-gritty of food. What to replace what with, how to find a source for that, can I live without this…do I want to. Today I am talking about not the nuts and bolts but my goals with this challenge. My Goal is to make meaningful and lifelong changes in my and my families eating habits. I want to eat real, healthy, unprocessed foods for the rest of my life. I want my kids to know what real food is and seek it out all of their lives. I want real food to be the real norm here on the farm, for this month and for all time. I am so excited that I will be starting this journey not alone floundering in the dark but with like-minded people who can share my triumphs and commiserate with my failures. Those more knowledgable than I that are willing to share their expertise and their experience. Those less knowledgable than I that give me a reason to share and explore the process. Thank you for joining me on this little adventure that we have titled the REAL FOOD challenge! Can’t wait to see you all Monday when we start what could be a life changing challenge! Let’s Get REAL! Because I’m stubborn and maybe a little bit of a control freak. That is why I’ve chosen to take the steps toward a more sustainable lifestyle. Well that and I have a huge appreciation for farmers, nature, and people who think about their actions and how they affect those around them. Perhaps there’s a bit of repentance in there too, for all the stuff I’ve accumulated over the years, or purchased without care that it would be garbage soon enough; for all the 99 cent junk and sale items I picked up just because it was cheap. Real food is so very appealing because of all of my family and friends that have suffered illnesses brought about because of others’ irresponsibility and carelessness. I’ve lost trust in many of our food and care suppliers, because they are Big Businesses looking at the bottom line…but that’s another post. More than anything I want to prove to myself that I’m capable of getting that much closer to a responsible and more sustainable lifestyle. Will it ever be perfect? Probably not, but that’s the challenge: inching as close as possible without sacrificing too much happiness for our household. So, you ask, what will we be sacrificing for said happiness? Packaged bread products – I’ve been baking our own. Premade pasta – I’ll keep a backup supply just in case my experiments don’t turn out well. 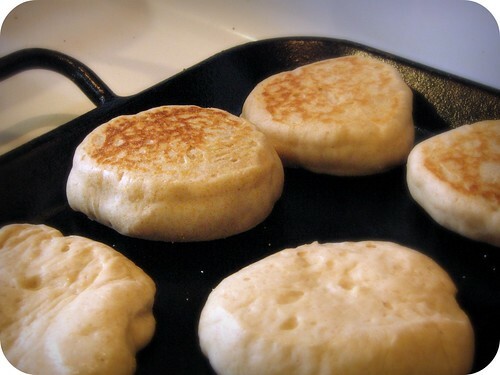 Boxed cereals – I’ll substitute homemade pancakes and English muffins (both freeze well), eggs, toast, and whole grains. Premade tortillas and wraps – I still need to find a good replacement recipe. Tomatoes, cucumbers, peppers and other out-of-season produce not grown locally in greenhouses. 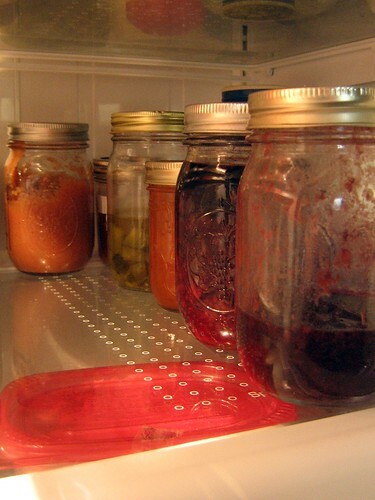 Store bought canned items – we’ll rely on last year’s crops that I froze and canned with the exception of tomato paste. Bananas, avocados, kiwi, and other imported items – unless it comes down to scurvy, we’ll be avoiding imported produce. Juice boxes – I will keep one pitcher of juice on hand for the Kid, otherwise we’ll do without. Cheeses not made within the state of TN – we’ll make our own mozzarella and spreading cheeses. Butter, buttermilk, and yogurt – I’ve been making our own with local milk for some time. All meat products will be sourced from a local butcher/processor. Eggs will come from local sources. Imported seafood – seafood only caught in USA, avoiding farmed when possible. Canola, peanut, imported olive oil, corn, fancy nut oils – we’ll be sticking with butter, coconut, and California olive oil. Vanilla extract, garlic and onion powders, and anything not in whole form – I’ll do as much seasoning with herbs that I dried last year or prepare seasonings from whole product. Chocolate may be the exception here. Anything in a plastic bottle – This one will be tough and may have to be withdrawn for Kid and Hubby. I’ll attempt to refine my mayonnaise, make our own salad dressings and mustard. 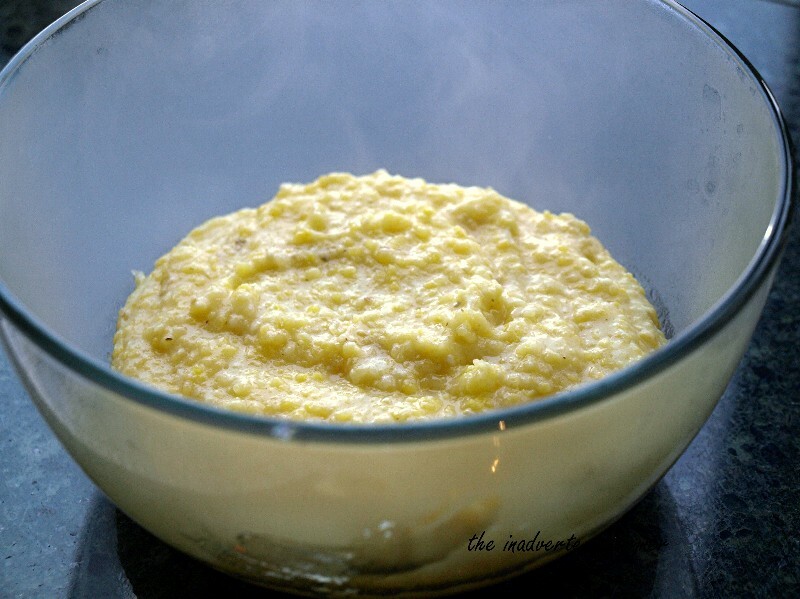 Instant yeast – only if I can master true sourdough bread. I’ll keep baking soda and powder because my baking skills are not the best. Tea – I can brew my own from my mint, lemongrass and ginger (purchased). Coffee – Fair trade if in the budget, non-negotiable; I will have coffee. We don’t keep Kool-aid or sodas, so no sacrifice there. We don’t often buy chips, however we do keep crackers (I will sample several recipes). I can pick up local popcorn as snack item. Desserts will be homemade and restricted to the same measures listed above. Okay, don’t panic! I know this list sounds like a lot to give up. There may be things I fall back on. My family may boycott and take emergency hamburger runs into town on occasion. While I have more time than a working parent, if made in larger portions most of the food we’ll rely on will store well. It may take part of my weekend to prepare foods in advance, but it will become a family affair. 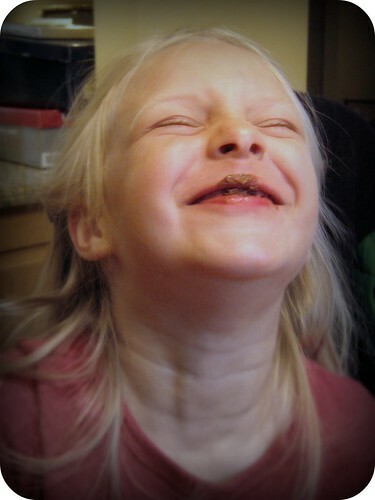 The Kid will happily assist me with cooking and baking as long as she gets dirty and has the first taste. And is there anything much better that can I teach her than how to feed herself and those she loves and all while being more responsible to Nature? Well, what will we get out of it? A sense of pride and accomplishment, knowing that we did it ourselves while snubbing a few Big Businesses along the way. Perhaps we’ll also reduce our footprint a little (and our waistbands). More than anything, I hope that we’ll have a greater appreciation for the food we eat, learn some and teach some, and gain a greater respect for those that keep it Real. Real Food Challenge: Chiot’s Run is IN! I’ve always been a cook from scratch kind of girl. I grew up in South America where convenience food was not available. We were excited to get a box of cornflakes several times a year as a “treat”. My mom made just about everything from scratch, so I learned to cook this way. Cakes and brownies never came from a box, cookies never came from a bag, doughnuts were made the night before and raised overnight (and were so delicious), and pizza came from our own oven. I loved oatmeal made from oats in a big tin, never the instant single serve packs, they are too sweet and taste kind of raw to me when I had them. All of our birthday cakes were homemade and decorated lovingly by my mom (and they were AWESOME!). My mom was also an adventurous cook, she kind of had to be. The grocery store was filled with tropical produce like yucca, plantains, mangoes and guanabanas. She was also fearless, not batting a eye when we had to make paella for a group of 20 coming for a meeting. When someone would bring us a freshly caught 20 lb catfish, my mom would cut it up, send some to the neighbors and cook up the rest. As a result of this, I never was a convenience/processed food kind of a person. This isn’t to say we never bought chips and candy, we ate our share of Pringles and drank a serious amount of Coke. We had a huge garden whenever we were living in the United States growing tons of veggie and spending all summer canning & freezing for winter eating. My dad’s always been a big hunter, so our freezer was always full of venison and other wild game. Part of the reason my parents did is because they couldn’t afford to buy processed food. It was much cheaper to grow your own and make things from scratch. Mr Chiots on the other hand grew up with in a household where nothing was made from scratch. He ate toaster pastries for breakfast, mac n cheese for lunch, and pizza from the delivery guy for dinner and a vegetable rarely crossed his plate. He had a bit of a hard time switching to the made from scratch healthy lifestyle when we got married. We had an adjustment period, merging our two tastes. For a few years we ate a mix of processed food and from scratch (and from scratch made from processed ingredients). Every year we would delete a few more processed foods from his palate. Now he proudly says he can’t handle the taste of processed foods because they taste “chemically”, we were even able to nix the Heinz ketchup from our pantry (except a bottle of organic kept for visitors), which was the last stronghold for him. In the past few years we’ve been focusing on taking our diet to the next level. We switched to a mostly organic, mostly produced at home or locally food chain. We have successfully deleted just about everything made in a factory from our diets. 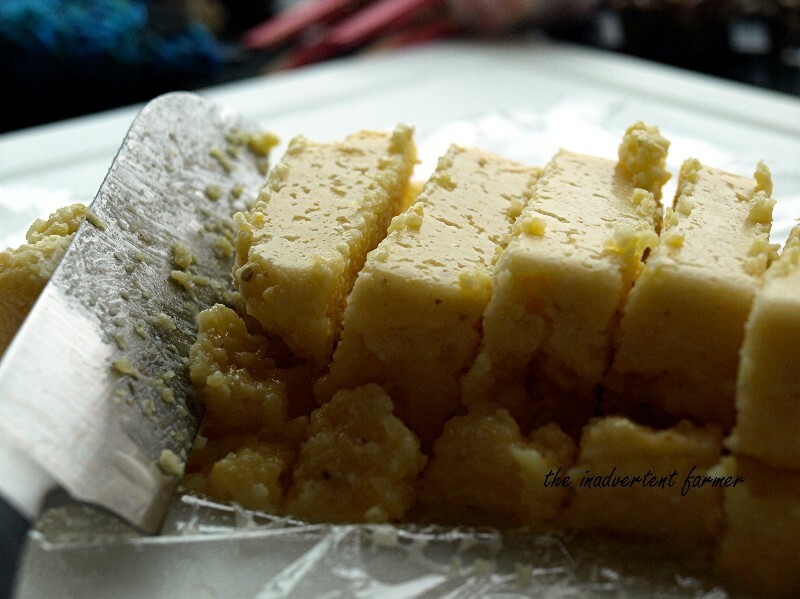 We try to buy things in their least processed forms and use those to cook at home. We now buy wheat berries, grind them and use sourdough starter for our bread. We make ketchup and various chutneys, sauces and vinaigrettes at home. Our butter is made weekly from raw milk cream we get at a local farm. I no longer go the grocery store, I go to the farm each week for milk, eggs, chicken, I hit the farmer’s market several times a month, the garden out back produces veggies in the spring/summer/fall, the pantry is chocked full of tomatoes, fruit and pickles for the winter, I use the co-op for bulk grains, sugar and other staples, and occasionally the internet, the local health food store or a Whole Foods for items like fresh ginger and coffee which I can’t purchase locally or grow myself. We even tap our maple trees and keep bees. You may wonder what exactly I’m going to do for the Real Food Challenge since we already eat a mostly unprocessed diet (I know what you’re thinking, these people make their own maple syrup & keep bees, what more could they do?). I’ve been trying to transition to a more seasonal diet for the past couple years, and haven’t been doing super well so I figured this would be a great chance to really work on it. The main reason I want to try to eat more seasonally is to reduce the amount of processing on our food even more. I’m sure fresh winter greens are much healthy than the home canned green beans from my pantry. Not only will our diets be healthier if we can eat more seasonally, but I’ll save tons of time and energy in the summer by not doing a lot of canning. Instead of my winter diet being basically the same as our summer diet, I’d really love to get to a point where our diet is different each season. Because we’re still in winter here in Northeastern Ohio, it looks like we’ll be eating more bitter winter greens (which we’re not super fond of yet) and those veggies that store well without processing, like squash (which we’re also not super fond of). I think the big challenge for us during the month of March will be trying to find ways to prepare foods we don’t particularly like. The good thing is that it includes onions, potatoes, mushrooms and other things we really love! I’ll be blogging about our challenges at learning to love new foods (they say you have to eat something 10 times before you can rule it out as a dislike). I’ll also be posting about taking it to the next level. For those of you that eat a fairly homemade lifestyle already, I’ll be talking about switching to the least processed options of foods you already eat. Perhaps switching out your morning oatmeal or granola with some soaked oat groats or barley. I’ll talk about using wild yeast (sourdough) instead of quick yeast in breads and pancakes. I’ll talk about finding places to buy the least processed options of staples like wheat berries, nuts, seeds and spices. I’ll also talk about learning cooking from scratch without spending all your time in the kitchen! How seasonal is your diet? Why are we doing the Real Food Challenge? We have been discussing this Real Food Challenge here at the Roost. The main thing I keep hearing from my gang is “Why?” “We already do most of this.” “We already know this stuff.” etc. My first reaction was “I’m the DAD and I say we are doing this, so just deal with it!” Not very effective, I know. Next I tried the “save the world, be a good example” guilt approach. Didn’t work either. They are willing to do lots of good work to make the world a better place, but giving up Cheetos doesn’t seem to fit. So then I had to really ask myself “Why?” What’s the point of making this the focus for a month. Do I really think it will change the world? Or even change our lives? Probably not. At least not in any grand way. So, why bother? I’m reading a book right now by Jack Kornfield. It’s called After the Ecstasy, the Laundry. That pretty much sums up why I’m doing this challenge and why I’m dragging my family, somewhat unwillingly, into it too. The Laundry, the mundane daily grind of life that makes a mockery of Ecstasy, Ideals, Philosophy. It is a hard thing to sustain change in your life when you are surrounded by forces prodding you to move/live in another way. After a week of scrambling around trying to find Real Food in a market where it doesn’t exist, and making meals that your family eats grudgingly, the shine goes off the project and you start to slide (maybe you don’t, but some of us do…) So, we are participating mostly to get and give support. To share the frustration, the successes, the challenge with others. I hope to learn some new things along the way, and share some of the things we have figured out for ourselves. That will make it really fun. But mostly, it’s laundry, and knowing others are doing laundry too will help. I don’t have a shopping list like Kim’s. We will struggle with fresh produce. We will be pushing our spring production schedule forward as fast as we can, but it won’t be enough. Getting to focus on food will help spur some of these projects along. We will learn to use more whole grains, and try making our own flour. We will be giving up all the crackers and chips unless we make them ourselves. We have experimented with this a couple of times and haven’t had much success. Most of the things we have made in this category have been very time consuming and somewhat unsatisfactory. Looking forward to hearing how others deal with this. We have made pasta before. We like it and will be making as much of our own as possible. It takes a lot of eggs, so we will have to see how productive our chickens are this next month. I’m not sure we will improve our lot or impact the system if we buy eggs to make our pasta. I’d rather close down the big egg producers. I do know some local people who sell eggs, so I should be able to get them if needed. We will be making lots of cheese. Right now we have both cows milk and goats milk in good quantities so we should be able to do some new things. We make some of our own cheese, and all of our yogurt and other dairy products. There are some hard cheeses that we haven’t had much luck with, but we use them in very small quantities, and will probably do without. We have a couple of small cheese houses in the area. They are large enough to be commercial but small enough to still be local independent producers. We’ll use them for any cheese we can’t make our selves. Tea, coffee, wine, beer, are all on the list of things to grapple with. I don’t know what answers we will find. 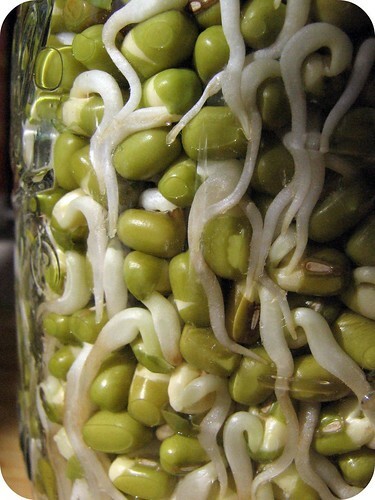 We are also going to try to create a local network of Real Food people. I think that is key if we want to change the system. Sharing, supporting, creating alternatives at a local level are things that will keep this going beyond a month of Ecstasy. This is the week where the rubber meets the road in my challenge preparations. My grocery list for this week is in some ways the same as every week…some ways are profoundly different. Main meals will not be too much of a stretch for me but the convenience of things like granola bars and cereal will be more challenging. Trail mix will replace chips, homemade granola and grains cooked overnight will replace boxed cereals. Homemade nut milk will replace purchased Rice Milk. I am searching for ways of buying from local farmers instead of the supermarket…although March is not a high time for farmer’s markets. We do have a grocery store that carries local produce, I will be asking my produce manager to point to in that direction. I have also started greens in my sunroom with the hopes of maybe harvesting at least a small amount of fresh baby greens next month. I am excited, the kids don’t care one way or the other, hubby is skeptical…we will see if a modern family can really eat ‘real foods’ for a month! There are two things that I have me worried…pasta and ketchup. Can I make my own pasta and live without Heinz Ketchup?